Improve the appearance of skin with Perricone MD No:Rinse DMAE Firming Pads, a set of saturated toner pads that perform a firming and brightening effect. Harnessing the firming properties of DMAE, the treatment pads deliver a concentrated dose to visibly lift the look of skin over time. 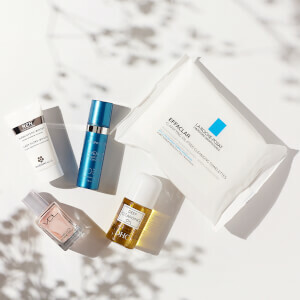 Helping to tighten and tone the look of aging complexions, the lightweight solution tackles fine lines and wrinkles to leave the face looking smooth, youthful and radiant. Dr. Perricone recommends smoothing one saturated pad all over a cleansed face, bringing down to the neck area in the morning or evening. Water/Aqua/Eau, Dimethyl MEA, Citric Acid, Pentylene Glycol, Fragrance/Parfum, Phenoxyethanol, Ceteareth-20, Cetearyl Alcohol, Glyceryl Stearate, Ceteareth-12, Cetearyl Isononanoate, Cetyl Palmitate, Sodium PCA, Menthone Glycerin Acetal, Allantoin, Disodium EDTA, Ethylhexylglycerin, Linalool, Citronellol, Geraniol, Limonene, Citral, Phosphatidylcholine, Zinc Gluconate, Magnesium Aspartate, Copper.